I have 2 children and live in Bristol with my husband and our puppy cockapoo Rosie. I found out about The Curly Hair Project in July 2017 when my daughter was diagnosed with ASD at the age of 11. As we finished with the consultation the paediatrician gave me lots of links to useful websites and talked about CHP in particular as a resource to support my daughter. It was a great piece of advice! I made it my mission to become as knowledgeable as possible about Autism to help my family and me cope with what was, at that time, a very different future. It’s been an interesting year. 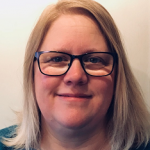 I have had a varied career working in many different organisations and roles and after an exciting 16 year career in law enforcement, I am currently a Change Manager in Higher Education. Being a change manager means lots of things to different people but essentially I help people manage change in the workplace and help senior leaders understand what change will mean for their staff. I spend a lot of time facilitating groups and workshops and have been a trainer and lecturer in a variety of subjects helping make sense complex topics. I also spent a number of years as an early years drama and interactive storytelling practitioner, which was a great way of helping children make sense of the world and helping with communication skills (although I spent far too much time dressed as a fairy). As a parent of at least one autistic child (my son is also probably ASD) I feel I can give an insight into real life experience of living with ASD. I have also worked with professionals as a lecturer in Further Education and as a safeguarding governor. All this, coupled with content written by Alis as an autistic adult makes a great mix. I am excited and thrilled to be able to work with Alis and The Curly Hair Project and am looking forward to running conferences and Bristol, Somerset, Wiltshire & Gloucestershire.